Yesterday, at the Vancouver Writers Fest, I had the honour of participating on a panel discussing the adaptation of my first novel, The Best Laid Plans to the stage as a musical. This has been underway for over two years, now. But it’s really happening. 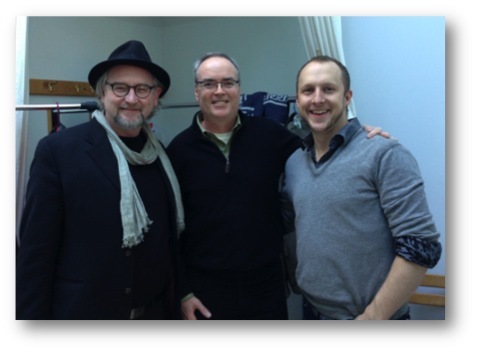 It will premiere in September of 2015 at the York Theatre, here in Vancouver. 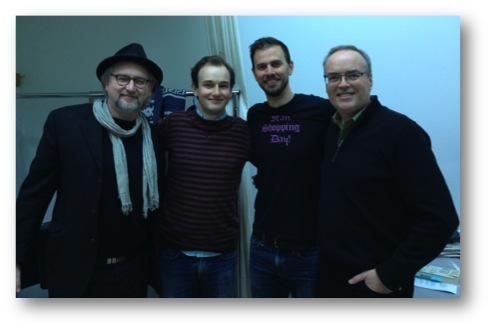 On the panel yesterday were Katrina Dunn, the Artistic Director of Touchstone Theatre, Peter Jorgensen, the play’s Director and head of Patrick Street Studios, Vern Thiessen, the Governor General’s Award-winning playwright who is writing the play, Ben Elliott and Anton Lipovetsky, the award-winning composers, and yours truly. It was quite an afternoon. I had met Katrina before when we’d done the initial negotiations for the stage rights to the novel, but I’d never met any of the others beyond a few emails with Vern and Peter. I was thrilled to meet them all and get an update on their progress. Then we hit the stage for the panel discussion in front of a sellout audience. Katrina was the ring leader. I offered a general overview of the novel. Peter described a bit about the history of adapting novels as stage musicals. Then Vern talked about what he considered when adapting TBLP to the stage. Then the fun started. I read three excerpts from the novel that led beautifully into three scenes and three songs from the production performed by the two composers and a wonderfully talented local actor/singer. Remember, I had never heard these scenes or songs, so I was taking it all in for the first time while on stage in front of a large crowd. My heart was pounding. All of the songs and the dialogue leading to them were wonderful, compelling and powerful. At one point in the middle of the second song, I very nearly burst into tears. It was a love song sung by Angus to his recently deceased wife, and it was beautiful, haunting, and very moving. Music is important to me. I’ve played guitar, written songs, and sung (not particularly well) since I was 17 years old. I played in a band in university. I think I have a sense of what makes a good song, largely because I’ve written quite a few bad ones. Ben and Anton are incredibly talented songwriters who seem to have a magical collaboration. In less than a year, when the show opens in Vancouver, I think you’ll agree that these songs will be with us for a very long time. Much more work lies ahead, but this is really going to happen. And I think it’s going to be something special. And by the way, the hovercraft will part of the play! About a month ago, I was approached to write an essay for The New Quarterly, a well-established Canadian literary journal, as part of their “Magazine as Muse” series. Writers are invited to reflect on what magazine captured their imagination in their early teenage years and perhaps shaped their future in some way. I was delighted to be asked by Bruce Johnstone and Editor, Kim Jernigan, in connection with the selection of TBLP as this year’s choice for the Waterloo Region’s One Book, One Community program. I’ve now submitted the essay and it will appear in TNQ #115, the summer issue, due out in mid-July. The TNQ blog is here. Choosing the magazine that influenced me as a 13 year old was relatively straight forward. At that age, I only read one magazine with any regularity after discovering stacks of back issues of Popular Science in my primary school library, when I was in Grade 8. I was captivated. There’s little doubt in my mind that being such an avid reader of Popular Science actually played a role in my decision to study engineering at university.Â But long before I headed off to McMaster in the fall of 1978, there were a few Popular Science inspired adventures that I chronicled in the essay. Without going into too much detail, PopSci often featured garage inventors who built something that flew, or went fast, or baffled the experts in some way. PopSci somehow made it seem possible for dreamers to bring their inventions to life. I wanted some of that. 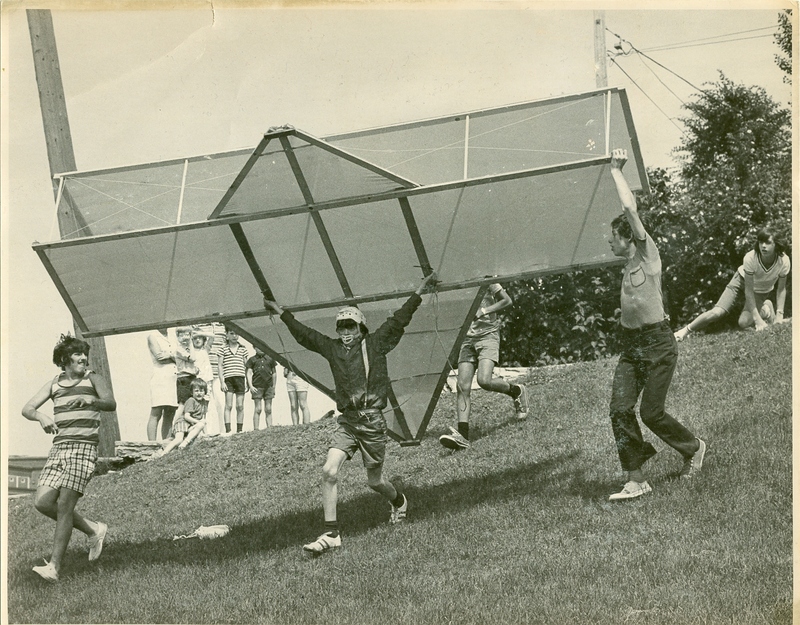 So while in Grade 8, my twin brother Tim, my friend Geoff Elmer, and I built three hang gliders. We called them the Falcon series. (We had to have a name for them, didn’t we?) You can read about my hang glider phase in the essay when it comes out, but I thought youÂ might like this photo of the (attempted) launch of Falcon 3 down the park hill at the end of our street. Yes, that is I, at 13, trying to take flight in June 1973. In hindsight, there was never any hope of me soaring anywhere that day, but still, I’ll never forget it. 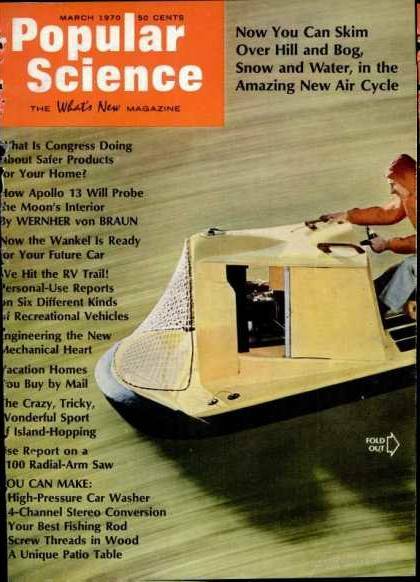 Our second Popular Science-fueled foray was the design and construction of a full-sized hovercraft. You’ll know if you’ve read The Best Laid Plans, that a hovercraft figures in the story. That’s because of my abiding interest in them. We were 15 when we built the hovercraft below. This grainy photo was taken in 1975 when I was still months away from earning my driver’s licence. I think Popular Science magazine may even have played a role in turning me into a writer. Just as its pages made it seem possible for us to build a hang glider or hovercraft way back then, perhaps it also made it seem possible that I might one day actually write a novel, let alone two.Â PopSci seemed to engender a sense that all things were possible. Even a novel. That might be a stretch. But I still have my subscription to Popular Science and still look forward to it each month. Here’s the cover of PopSci from March 1970 that sparked a lifelong fascination with air cushion vehicles and led directly to Angus McLintock’s Baddeck 1 in TBLP. I have an identical twin brother, Tim, who is eight minutes older than I. In the hustle and bustle of Toronto, where Tim also lives and works, we’re both daily approached by people who have confused one of us for the other. (You get used to it after so many years.) We’re still very close and play and coach hockey together. Despite my 20 years of public affairs/public relations consulting, I actually hold a bachelor’s degree in mechanical engineering. Though I’ve never practiced engineering, I use the methodological approach to problem-solving every day in my work with colleagues and clients. When I was 15, a friend and I designed and built a full-sized hovercraft. This experience helped push me towards engineering in university. I’m an avid hockey fan (Go Leafs Go!) and still play and coach. In my university days, I played guitar in a rock ‘n roll band. The only point worth noting is that our lead singer, Andy Maize went on to co-found the still popular Canadian band “The Skydiggers.” I still play guitar and write songs and occasionally perform with my twin brother (piano) and now my older son Calder (bass). After graduating from McMaster University, where I was bitten by the political bug, I joined the full-time staff of the 1984 Jean Chretien Leadership Campaign (we lost) and then spent the next four years working on Parliament Hill (federal politics for any non-Canadian readers) and Queen’s Park (Ontario politics) as a political staffer for Liberal cabinet ministers. I’ve been an avid (at times obsessive) chess player for nearly 20 years and still play online as often as time permits. I published my first novel, The Best Laid Plans this past September combining various experiences and passions including politics, engineering, hovercrafts, and chess. I podcasted the entire novel chapter by chapter in 2007 and it’s available on this blog or through iTunes. You can read more about the novel on this blog. There you have it. Eight things some of you may not have known about me. So what about the hovercraft in TBLP? I’ve had a number of listeners (well, one is a number!) 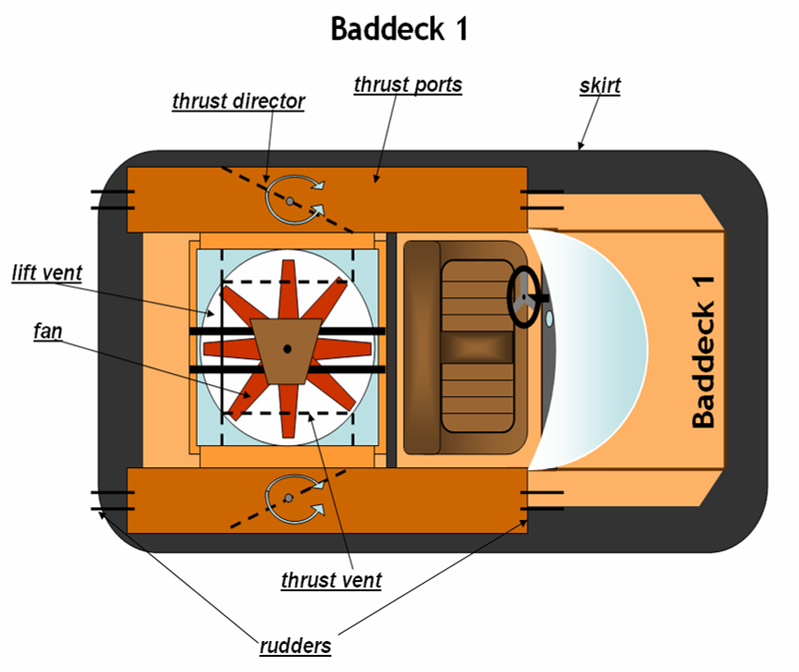 ask me about Baddeck 1, the hovercraft Angus designs, builds, and ultimately flies in the novel. Regrettably, no such hovercraft yet exists in the real world. I’ve always had an interest in hovercaft. 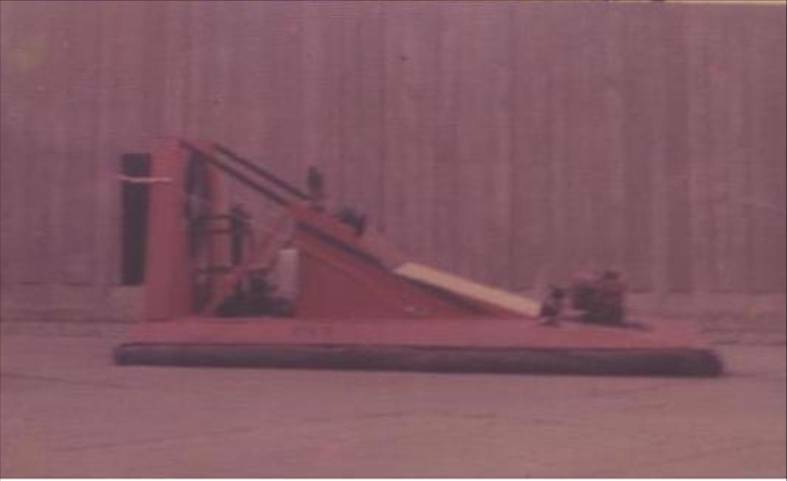 In my misspent youth, a classmate and I designed and built a full-sized hovercraft, dubbed GTH1. The rather official sounding moniker simply stood for Geoff and Terry Hovercraft 1. I know, very clever. Here’s a photo of GTH1 from 1976 on its maiden flight. I’m at the wheel at the tender age of 15 years. I think my high school hovercraft experience propelled me into engineering at university. While I have no regrets, in the more than 20 years since I somehow persuaded McMaster University to grant me an engineering degree, I’ve never practiced engineering professionally, opting for politics and then communications consulting. The road not taken etc., etc. Anyway, I like to think that Baddeck 1 is a rather innovative hovercraft design. It came to me and I sketched it out while in first year engineering, when I no doubt should have been taking notes in an Applied Math lecture. Not to get too technical about it, but moving to a single engine design and venting the thrust through the side thrust ports (see below), yields real dividends in weight, height, safety, noise, and control (in my humble opinion). Perhaps one day I’ll take a stab at building it, although I do push back the frontiers of ineptitude whenever tools of any kind are involved. Welcome to terryfallis.com where award-winning novelist Terry Fallis blogs about his writing life and podcasts his novels.